18 years ago, Spectre The ILL Saint emerged from the dark matter to begin his experiments in sonic elevation through low-frequency manipulation. 9 full-length albums later, his campaign of BASS TERROR continues with the latest salvo, The True & Living (WSLP057), a release that showcases both his consistency as an artist as well as his commitment to creativity, innovation, and originality. Like all his releases, The True & Living defies category. While rooted in the twin pillars of hip-hop and dub, Spectre dabbles in all genres and, in fact, leaves no sonic stone unturned. Whether it be the crowd of protestors in Tahrir Square on "Night Train to Cairo," the detuned berimbau that anchors "The Good Fight," or the chopped-and-screwed Smiths' sample on "Panic," The Ill Saint has always been known for his eclectic choice in sonics. An avid cineaste, he's also well-known for mining the gems of underground cinema, and the snippets from this album are culled from such cult classics as Videodrome, Altered States, and The War of The Worlds. Amidst the largely instrumental offerings, which veer from dub-hop to Middle Eastern to drum n' bass, Spectre also features some of his favorites MCs. Wu-Tang's own Killah Priest drops some scorching verses on the title track, while the ubiquitous Sensational returns to do it again in his inimitable style on "Triumph." On "My Rifle," Spectre also introduces the work of his nephew, John Fernando who passed away last year, and to whom the album is livicated. By now it is no secret that The ILL Saint is none other than the alter-ego of WordSound label boss Skiz Fernando, one of the hardest working, behind-the-scenes players in the music game. In addition to his prolific catalog of music Skiz has expanded his creative palette in the last decade to include filmmaking ("Crooked" and the "Made in Brazil" movie) and food (publishing his Rice & Curry: Sri Lankan Home Cooking cookbook and producing his "Pan Asian" cooking show on YouTube). All of these projects (links below), self-funded and executed under complete creative control, continue in his commitment to artistic integrity. Skiz Fernando didn't start WordSound Recordings in the 1990s just to put out his own music; he's always been part of a larger pool of artists, originally based in pre-gentrification Brooklyn and now scattered globally. 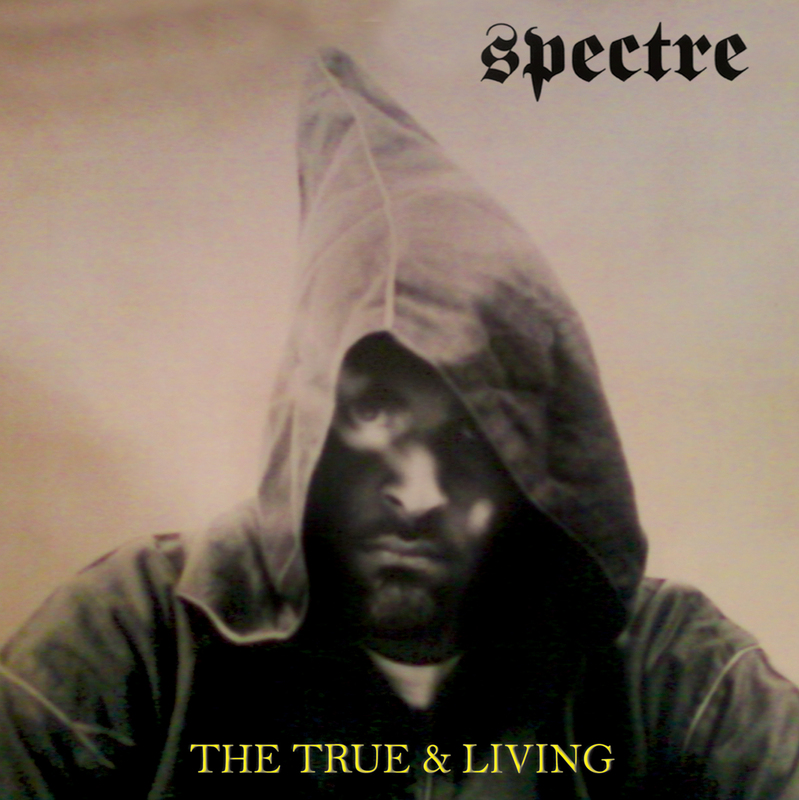 But along the way, he's released a fistfull of solo albums as Spectre. The True & Living is the ninth volume in his continuing chronicle of humanity's decline, and it's possibly the most impressive in his catalogue. Fernando's beat making has grown since WordSound's zenith in the late 1990s. The True & Living shifts from organ-shaking hiphop to seeting drum 'n' bass to dub that'll move books off your shelves, with extremely chopped Bernard Herrmann-esque strings stabbing at the ear. Since the music is primarily instrumental, the Spectre message is mostly trasmitted via spoken dialogue samples (from The Matrix, Videodrome, documentaries and new broadcasts, among other sources). A track called "Reality TV" pulls from the prophecies of the Videodrome character Brian O'Blivion, who utters the Eno-esque mantra "Television is reality, and reality is less than television; newscasters discuss environmental catastrophe on "Impending Doom"; and on and on. But two tracks feature guest rappers - The Wu-Tanf Clan's Killah Priest appears on the title track, while the awesome Sensational, still underrated after 20 years, takes over the unsettling anti-party jam "Triumph". Spectre's late nephew John Fernando produced the track "My Rifle", a brief interlude of sub-bass and creepy, minimal keyboards. The True & Living is an unsettling album, its addictive rhythms bolstered by an undercurrent of dread (in both horror movie and Rasta sense of the word) that makes it an ideal soundtrack to walking around city streets long past midnight, as long as you don't mind looking over your shoulder every ten seconds or so.